The visitor will enjoy the plenty international cuisine restaurants, some of which are “choked” in greenery, and others have small terraces or rooftops. Cafeterias, bars and discos many satisfy even the most demanding entertainment taste. 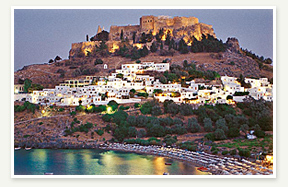 The guest will have fun shopping in big and small shops of the narrow and picturesque small streets of Lindos. You many find everything you desire, starting from the most artistic souvenirs and ending to important masterpieces.